Thanks to Winterlicious and my friend’s gift of picking great places to eat, I got a chance to experience a new way of dining. The Chefs’ House is a great teaching restaurant run by George Brown College Chef School. Having experienced the food that is made by the students from this school before at the One of a Kind Show, I was very interested to see this restaurant. During our lunch outing we decided to learn more about how the restaurant works by asking a few questions from Chefs’ House Dining Room Technologist, Scott McKenzie. Mr. McKenzie explained to us that every single person who works at the restaurant is a student at the George Brown College and studying to receive their degree in food and beverage management, hospitality, tourism or just studying to become a chef. All students have to work at The Chefs’ House once a week for 14 weeks to learn and gain more experience in their desired fields. 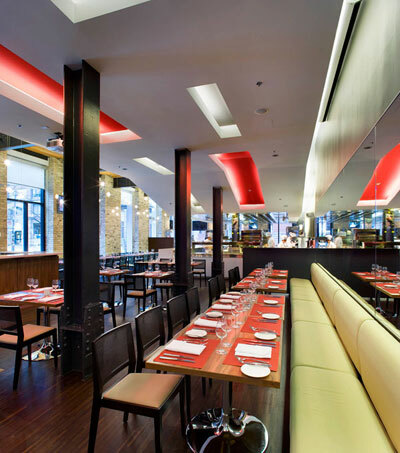 I loved going to this restaurant, a great modern dining experience with a Hell’s Kitchen twist! All the students working hard and being professional while their instructors keeping an eye on them both in the kitchen and the main dining areas. Thinking about how my experience dining and eating at The Chefs’ House might affect someone’s chance to become a chef gives me an odd feeling. Exciting, but odd! 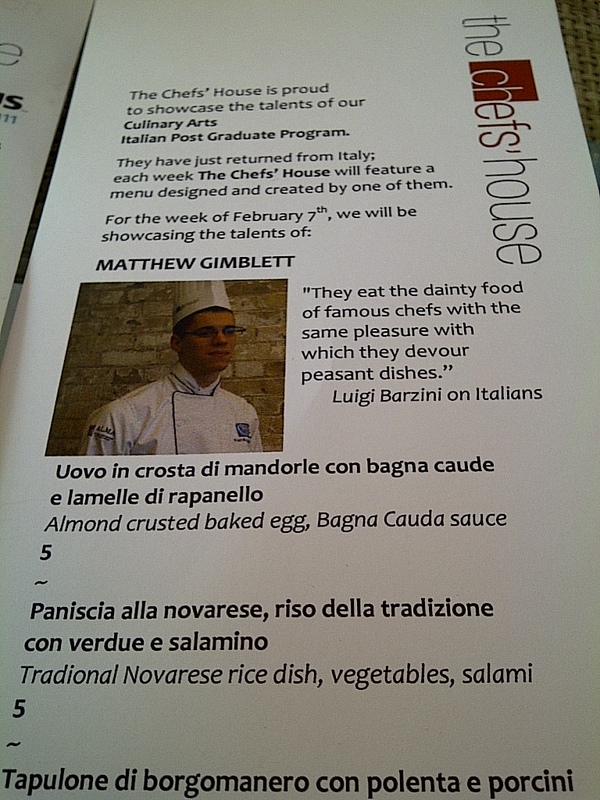 At our lunch we found out that in addition to the Winterlicious menu there’s another menu put together by one of the students who just came back from a culinary trip to Italy. Matthew Gimblett, made his way around to all the tables to meet and greet everyone and answer questions about his dishes. We all thought that was a great experience for both us and the chef to be. 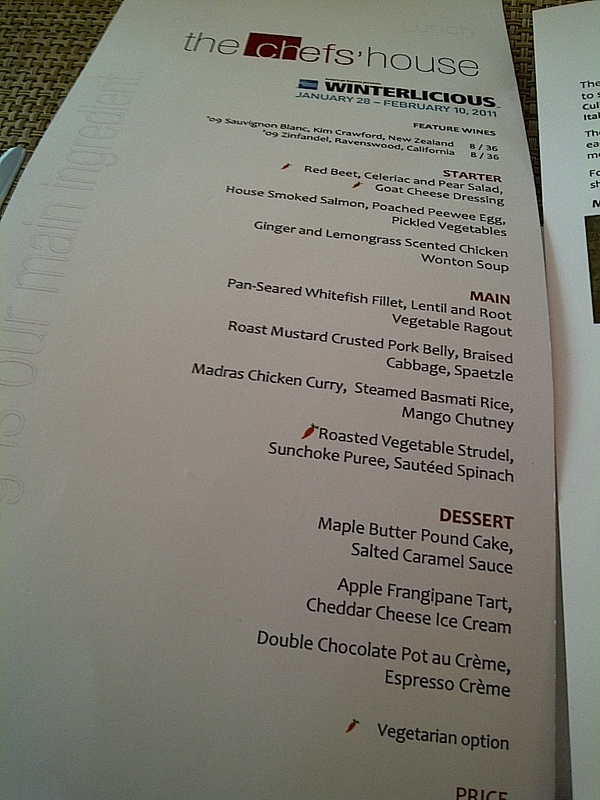 Now, it’s time to show what we picked from our 2 menus! Next stop…my 2nd visit to Lolo Restaurant! The food was really good here. You should give it a try, you’ll like it!